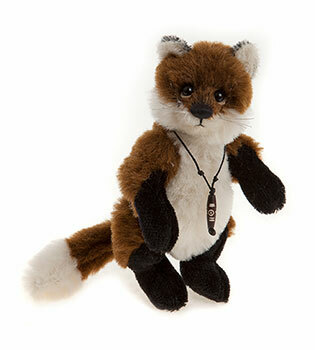 Charlie Bears Townend Fox Minimo Discounts Apply ! Townend The Fox is fully jointed and hand finished in Shades of White, Black and Brown Mohair and Alpaca (63% Alpaca & 37% mohair) has a Lovely Necklace around the neck. Made of the finest schulte Mohair and Alpaca, Hand stitch Nose and glass eyes made in the UK.